Image Components can edit images: saving most common images file types (*.tif, *.jpg, *.bmp, *.gif, *.png) and convert between them. Thumbnail view of the image multi or single page. Navigation between the pages, by thumbnail click or by toolbar. Image fit to the screen (original, best and width). Rotate left, right, flip and mirror. Zoom + and Zoom -. Inserting, appending, deleting or moving pages. Cropping by selection or auto cropping. ect. Image Components is a image editing, viewing and scanning suite. ...... tif, *.jpg, *.bmp, *.gif, *.png) and convert between them. Thumbnail view of the image multi or single page. Navigation between the pages, by thumbnail click or by toolbar. Image fit to the screen (original, best and width). Rotate left, right, flip and mirror. Zoom + and Zoom -. Inserting, appending, deleting or moving pages. Cropping by selection or auto cropping. Many filters like invert, grayscale, etc. Image enhance (color, brightness, smooth, sharpen, etc.). Many edge detectors. Glass tool to zoom a particular part of the image. 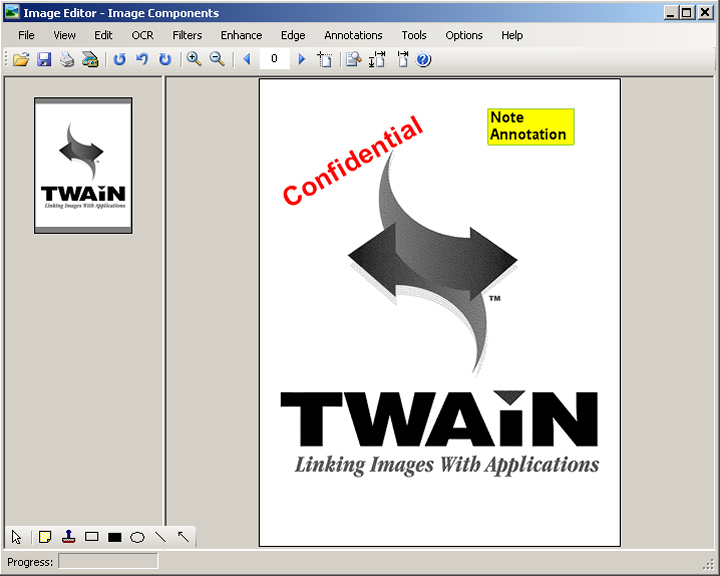 Twain support using ADF or flat bed, multi page or single page. Save and Scanner options by image type or compression (None, JPG, CCITT3, CCITT4, LZW) . PDF export, multi, single or selected page. Image Components gives you an example of how the components works, and the source code of the example program will be available on purchase. Qweas is providing links to Image Components 1.5 as a courtesy, and makes no representations regarding Image Components or any other applications or any information related thereto. Any questions, complaints or claims regarding this application Image Components 1.5 must be directed to the appropriate software vendor. You may click the publisher link of Image Components on the top of this page to get more details about the vendor.